The link says 76 but it really is Challenge 77. So what if the words are typical!!!!! What can you do with them that’s not so typical? But typical is good this time around. I’m going to try and get back in the saddle with the review with this weeks challenge. Wish me luck. Check out Guidelines 2 and 3 for something new added. But nothing that changes anything. Or you can use the 3/5/3 style instead of 5/7/5. What to do a little bit more with your Haiku? Read Haiku, Tanka, and Haibun. It’s all poetry to me. Learn the difference. Copy the link of your finished haiku URL in a comment so we can all go and visit your site to see what you have done. I will comment on your site. You can do a ping back. What’s a ping back? Put a link back to this prompt page, if you like within your post, as long as it does not take away from your haiku. This is simply a prompt and challenge to encourage people to try Haiku and give some a prompt and a place to share in comments so we can find each other. A link in your post does give others a chance to find us and join in. Use one of the two below if you like. Click HERE for a detailed article on Ping Backs. The Challenge is currently posted at 8 AM New York City time on Mondays to give people a better chance than the old 9 AM time. Deadline is Noon New York City time on the Sunday following the Challenge Post release. Not sure how to write a Haiku? Click HERE for a quick How to write Haiku Poem in English Form. ← Amber Wake: Gabriel Falling. Ronovan’s new Author Site Launch. http://wp.me/p4ayEo-YV Here are two for teh price of one! Makes the celebration that much more fun! Happy new year to you Ron! I am writing a tanka. Just the heads up that this should be #77 and not #76. I will ping back later to see if you change the URL or just the post’s title. I am writing a tanka http://yourblogcoach.com/2015/12/28/dread/. Just the heads up that this should be #77 and not #76. I will ping back but do let us know if you change the URL or just the post’s title so we can correct it on our blogs as well. And to all who stopped by, left a comment and showed some appreciation for my scribbles, I thank you. To you and yours, my wish for you is a healthy, happy, prosperous, PEACEFUL New Year!!!!! I thank you, so very much indeed. May your New Year be a blessing. A year so full of words flowing and freed. May your New Year have no stressing. A year that will move with less speed. Easier to write than to do! Hahaha. That’s great. The haiku was amazing. A joyful entry this week, introducing a brand new list of Photo Prompts for 2016! Eeek! I’m excited! Happy New Year Ron and many thanks for this wonderful Haiku community! 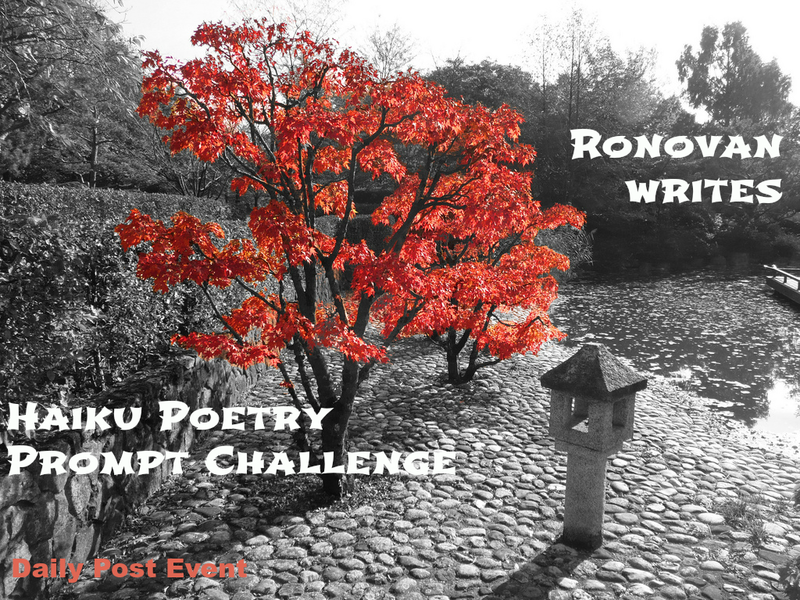 Ronovan, I am trying to enter your haiku challenge for the first time. Not sure if I am doing this right. My post is at http://onetahayes.com/2015/12/29/843/ I forgot to give a title so I don’t know if it will link back correctly. Hope so. I’m testing. New years eve and the whole thought of it becoming 2016 already is truly surreal. A wonderfully happy and healthy New Year to you sir and looking forward to your ongoing wonderful posts. For once the pingback worked! I enjoy your haiku challenges and this one is so appropriate for this day. Hi Ronovan. Here is my contribution to the last challenge of 2105 delivered on the first day of 2016. https://haikuhound.wordpress.com/2016/01/01/new-year/ . I thank all the wonderful sharing community of poets who have inspired me in 2015. I especially thank those haiku artists who have encouraged me with comments and support. I finally thank you Ronovan for your selfless time, untiring creativity and encouragement to all of us who draw so much from participating in your weekly challenges. Happy New Year to all of you. Happy New Year Ronovan – may it bring all good things to you and yours. This one was much harder than I anticipated – and I ended up going in a completely different direction from where I started. Just like life really. I have it updated now. Couldn’t find a previous link in the comments. WordPress can be wonky at times. Willy Wonky.